Light your home in new, creative ways with the Philips Hue Bloom Dimmable LED Smart Table Lamp. Enjoy your own personal light show at home, capable of millions of colors and shades of white light, able to sync to your favorite music, movies, and games for an enhanced experience. Designed to create indirect ambient lighting, this light is a perfect way to highlight specific furniture or architectural features in your home. Simply place it near the object and plug it in. 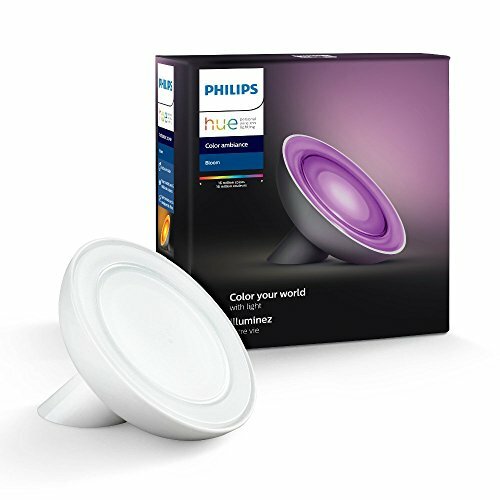 Add a Hue Bridge (sold separately) to control with the Philips Hue App. Expand your lighting system with Hue accessories (sold separately) such as a Hue Dimmer switch, Hue Tap, or Hue Motion Sensor. Control your light with voice using Amazon Alexa, Apple HomeKit, or Google Assistant. Integrate your Hue lighting for convenient smart home control with Nest and Samsung SmartThings. This box includes one Hue Bloom and two-year warranty. Control your light with voice using Amazon Alexa, Apple HomeKit, or Google Assistant. Integrate your Hue lighting for convenient smart home control with Nest and Samsung SmartThings..This box includes one Hue Bloom and two-year warranty.